Over the weekend I discovered the Ladies of Letters project, and I immediately fell in love. Ladies of Letters is a collaborative project from the very talented Carla Hackett and Amy Constable (AKA Saint Gertrude). 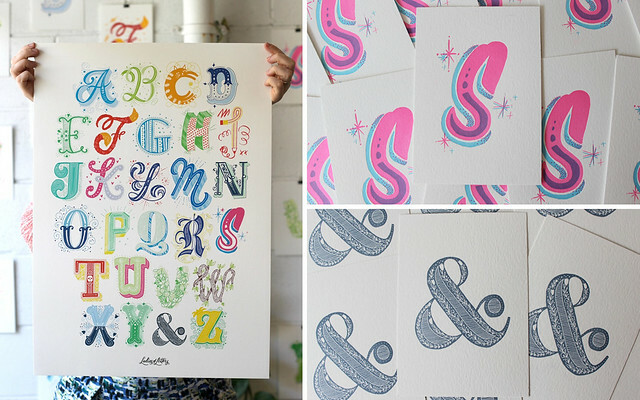 Together they’ve been busy lettering and printing a set of awe inspiring letters which you can buy here. Better yet? A percentage of all of their sales are donated to The Australian Literacy and Numeracy Foundation whose aim is to raise literacy levels throughout Australia. How amazing is that? There is little I love more than beautiful design paired with helping a good cause :) I am particularly obsessed with the style and color of that “S”! Hot pink mixed with nods to vintage lettering? Yes please! Check out this incredible video showcasing their work together! I guess videos featuring letter presses are my thing lately, but come on, what’s not to love? And while these ladies make excellent work together, they also create some incredible things separately as well. Just look at this beautiful lettering from Carla Hackett! I am absolutely blown away by her work. Hats off to her gorgeous brush lettering! I definitely want to brush up on my skills after looking through her impressive portfolio of work (brush up, get it? Get it?! *elbow elbow* …okay, sorry. Too corny, my bad). Saint Gertrude has some incredible letterpress work too which you should definitely take a peek at. If you’re in Australia, you should probably also go to one of her letterpress workshops too because they look incredibly fun (and I’m insanely jealous of the people who get to learn under her guidance).